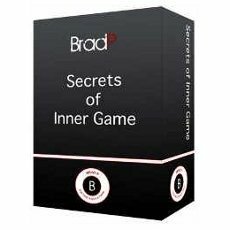 An audio seminar where you will learn 18 of Brad P "Secrets to Inner Game." When you buy this audio program, you will automatically be subscribed to Brad P's 30/30 Club membership program (http://www.datingskillsreview.com/30-30-club-brad-p/). You will be charged $29.99/month starting 30 days after your first month of subscription. A waste of time and money. This is a recording of what this Brad P guy teaches at his "Pickup Mansion": it's just a bunch of talking with lots of personal stories from his pupils to fill more time. Just read the list of topics and that's all you'll get: not much else. The author asks for opinions from these "students" when he runs out of things to say, the advice is just common sense and he even mentions Tim Ferriss as an example (some kickboxing stupid story): it's a complete waste of time. "One of the Best Product on Inner Game"
If you feel stuck with your improvement, the reason might be your "inner game". By far, I can see that it really addresses some of my broken pipes, and while listening that course, I felt like my mindset started to change in positive way. "Nice Overview But Little Depth"
It peaked my interest, but still left me with a ton of questions. Personally, Collection of Confidence was ultimately the product that really helped me. Brad P's products have left me with more questions than answers, unfortunately.